1) When you just ignore the plans. Artists renders play a large part in the promotion of these schemes. They always show family scenes of sit up bikes trying to invoke continental Europe rather than the racers and mountain bikes bombing along like underpowered motorbikes that we have here. Ignoring that they never show the bins, A boards, signs, lights, direction totems etc etc that are dumped on the pavements. But ,you say, that lighting mast was supposed to be moved. 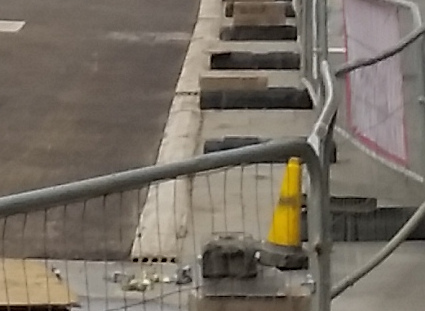 Looks pretty set in there and will be messy to move now as no provision has been left on the median to easily move without digging up slabs again. You know its just pavement users that are going to be inconvenienced so we know the councils attitude to that as long as cyclists , as with other vehicles , get their little uncluttered road. But, you also say, doesnt that change the viability of the supposed separator strip that was claimed to help impaired people safely navigate this street. 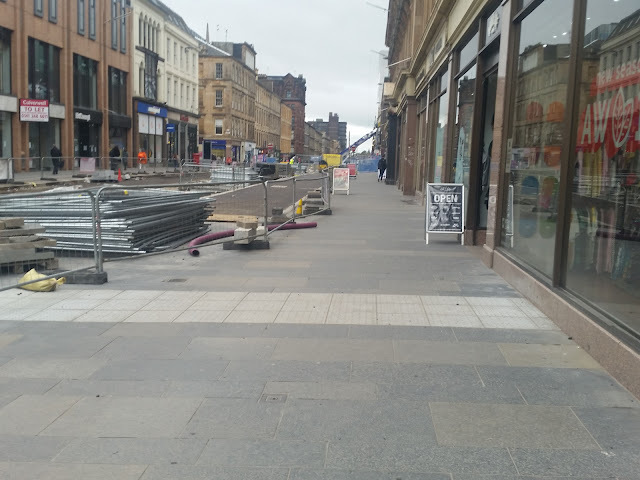 Lets forget all of the bins, a-boards etc etc that will also be placed along the strip rendering it useless and remember this as it is immovable. As little as the council cares for pavement users they care even less for impaired pavement users either by disability or age. 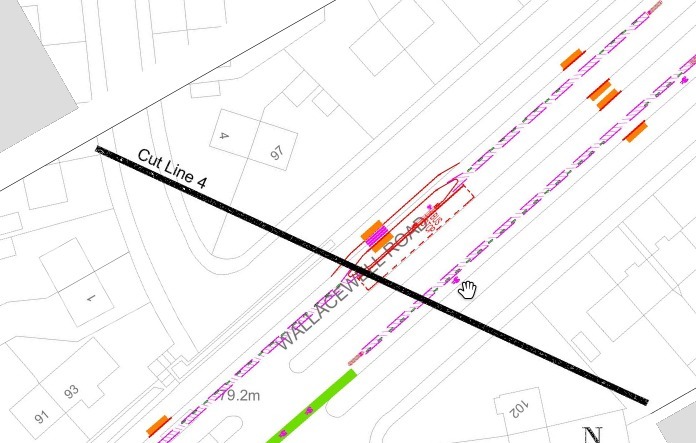 2) I will save this for now but this will be partially dug up again to install crossing controls unless they have decided to ignore them as well. If they are leaving the current crossing signal it is on the wrong side and the tactile is the wrong colour for a controlled crossing.The markings are specific colours for a reason and you dont get to change them for aesthetic reasons. The barriers around the control box make it useless as does leaving the ground unsafe at the base. 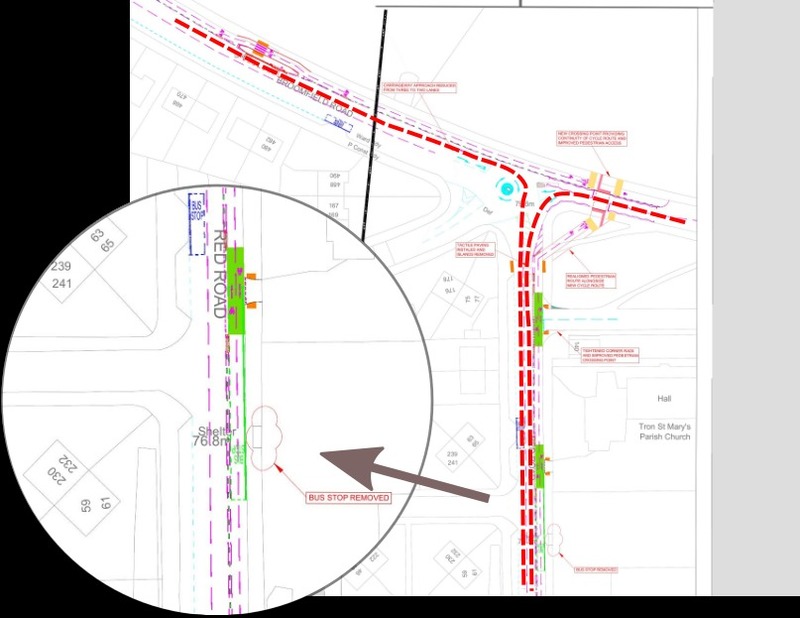 The entry and exit to the little cycle road is through the people waiting to cross the road as the plans showed. What fun !! Who cares about pavement users ? I guess this is just going to be never ending from now on. Pavement users, as not all of them are walking ie pedestrians, are treated as the lowest form of traveller . In spite of all analysis and thought being that they should be the priority and designs should come from that. Lets be clear about a term; Active Travel means cyclists , walking is a convenient sounding add-on used to justify the expenditure. 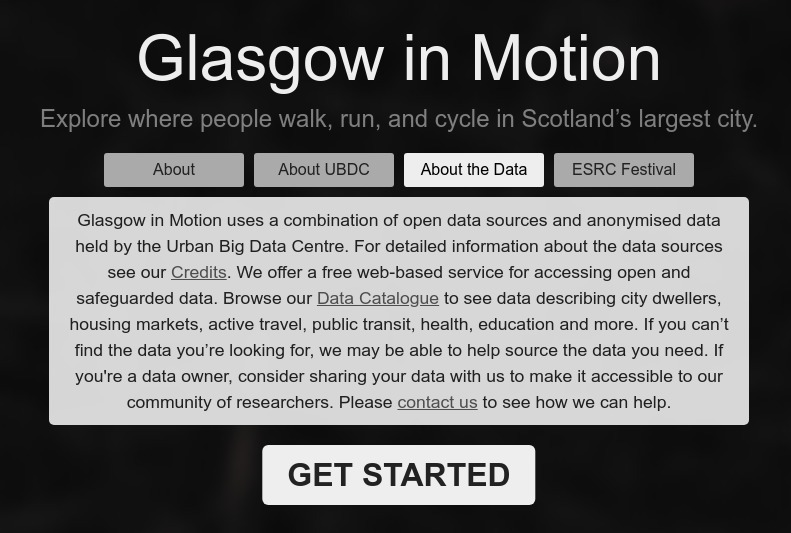 It is clear that the pro cycling groups brigade online surveys and push agendas that are detrimental to other groups eg elderly, disabled and children that have limited access to this format of testing public opinion. So when it gets dark there is no continuous path for pavement users as there is for cars,buses and bikes. Walking south ( ie back to traffic ) on this street goes from being 100% safe from traffic to 100% lottery if a cyclist uses this at speed when a bus pulls up and people get on and off. Dont forget the angled tactile leading directly into walls and narrow sections that with one step more go straight on to the road and into traffic. Very faintly you can find the wall line but no clear indication that is a solid boundary. "tiny tiny amount of foot traffic" ; Judgemental and unqualified. At a minimum everyone getting to and from the the bus stop is using the pavement. They will be coming from and going to their houses using the bus stop. 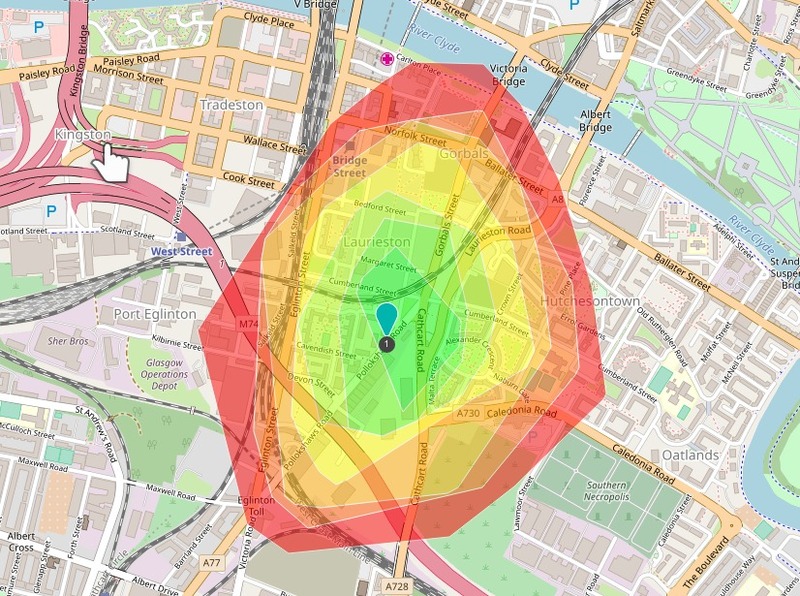 A probably over generous isochrone showing where you can walk in 7 minutes from that bus stop. 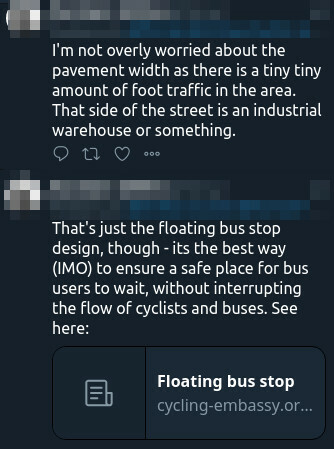 "A safe place for bus users ( PAVEMENT USERS ) to WAIT without INTERRUPTING the FLOW of CYCLISTS and BUSES"
Where to start with this arrogant nonsense. Are cyclists actually dangerous vehicles to watch out for ? Pavement users have to cower on a non pavement ( "floating bus stop" ) so as not to get injured. Priorities all wrong. Think what this will be like on darker days and worse weather. Should cyclists be made to follow the mobility scooter speeds for pavements on sections like this ? I posted about this last November but it is now in place. 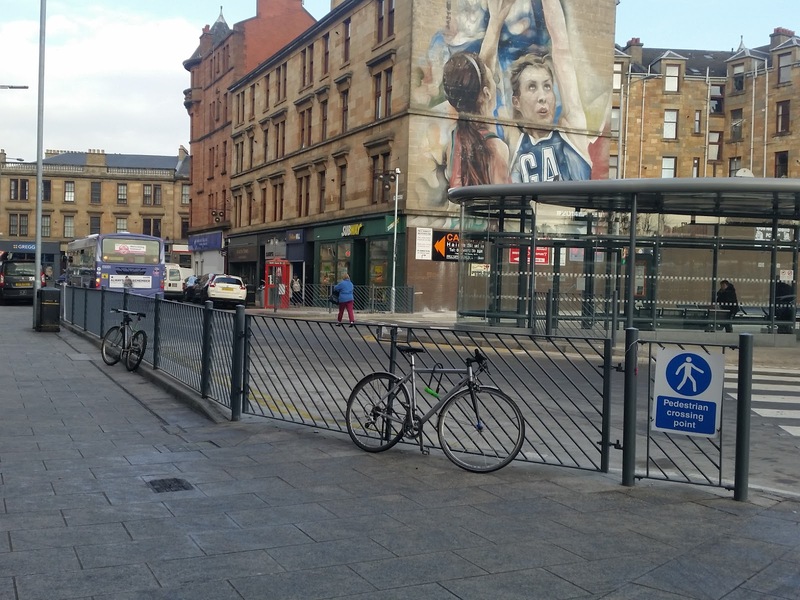 These are the entry and exits to the cycle path that directs cyclists through the people waiting to cross Rose Street and Sauchiehall St. 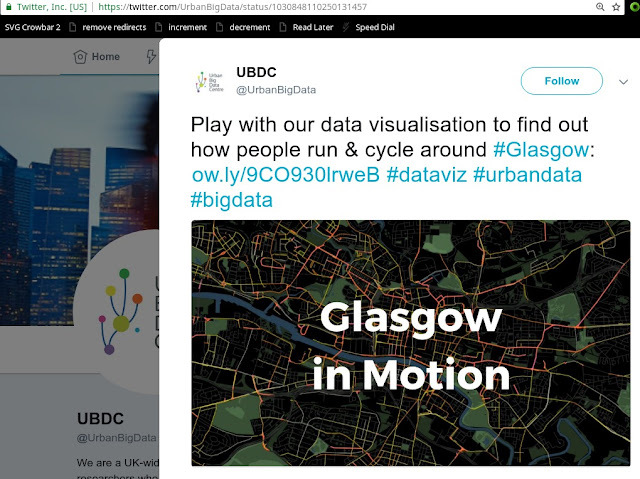 I guess to go West they have cycled up Sauchiehall Street or gone the wrong way down Rose Street or Blythswood St( non Core path ). 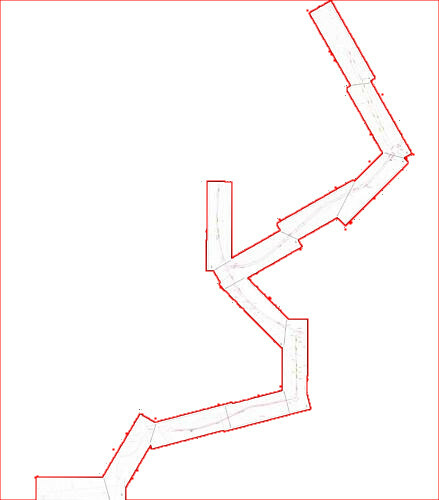 The widths given over to the different parts are clear now as well. Also the street clutter that will be dumped on the pavement part is visible in context, add in digital signs, seats, tables etc. 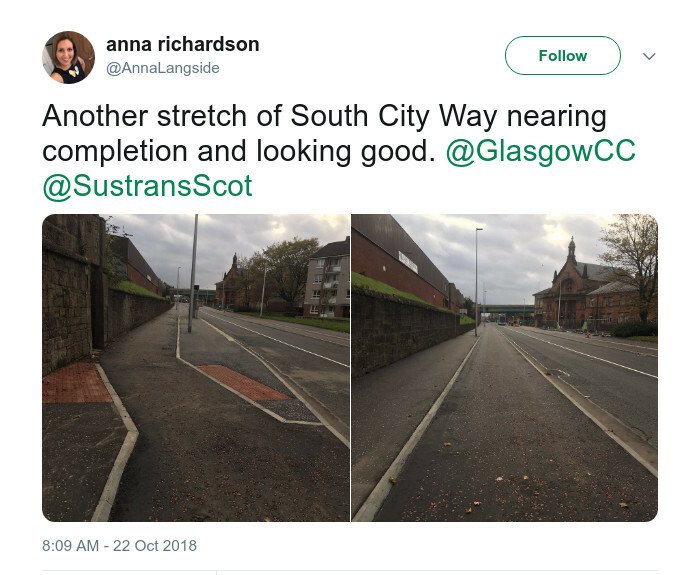 Remember the cities own numbers showed this stretch was used by 11,000 pavement users a day and 500 cyclists but this is the split they have built. A cynic would think the plan is to make it look like there is an apparent percentage increase in cyclists by making it dangerous for pedestrians and stop them using the street. We will soon get to see the sections with the exits from the bus stops behind digital signs directly onto the west bound cycle way. You can also make out the bumps supposed to segregate pavement users from cyclists. Are cyclists going to have a speed limit and if not are mobility scooters that will also use this. A light dusting of snow will cover those up nicely. Pavement users need to be more active in reporting hits and near misses from vehicles inclusing bikes. Too often they shrug them off as part of using the streets and so the scale of the problem is missing from the statistics and ignored in planning. It does say run but we would be interested in pedestrians , by far the majority but lets keep an open mind. 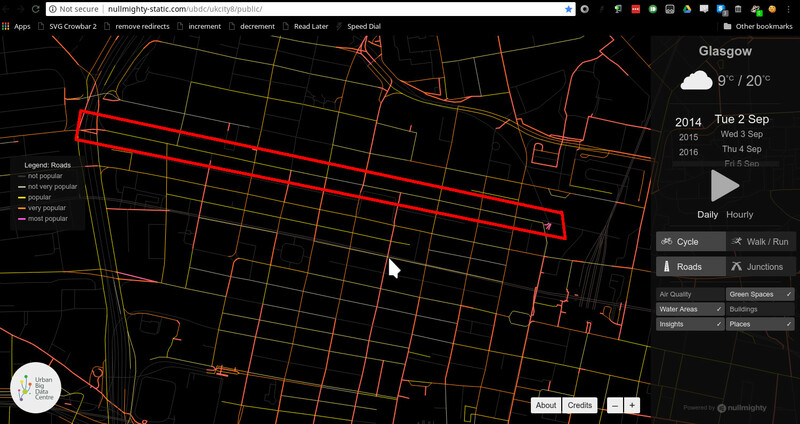 Oh boy its just strava data with pretty colours. There used to be good numbers available for the streets and basically showed cyling was 4.9% of pedestrian traffic this is not shown here at all and would enable designs that are dangerous for pedestrians. I have managed to display a day we have actual data for . I also use this day in an earlier post about the Sauchiehall Street Changes. 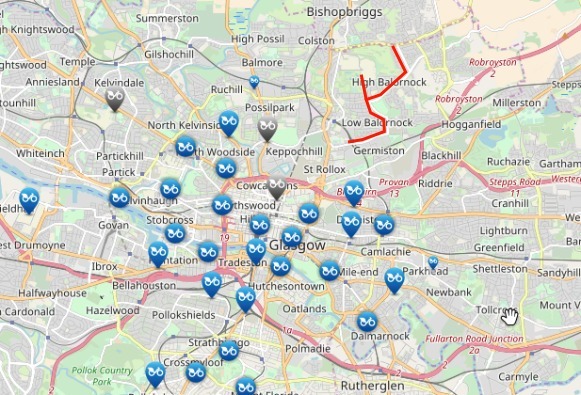 Highlighted in red is Sauchiehall street on Sep 2 2014. In these displays they look basically the same. However in the numbers there were 11,000 pedestrians and 500 cyclists. Nothing in this display shows anything like that. This was people standing on the street counting people not relying on them being able to afford the required hardware and subscription and allowing their data to be counted. 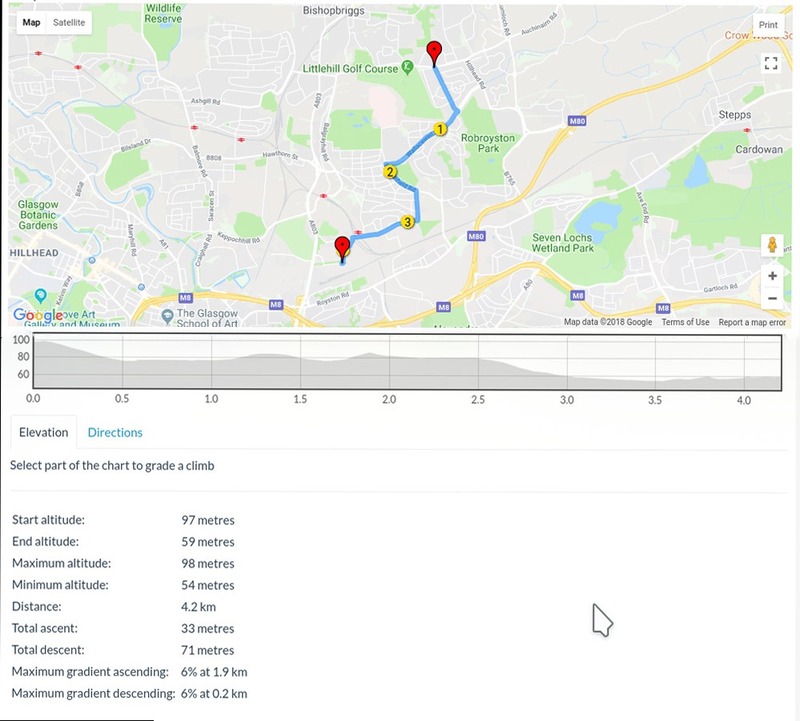 How do the map labels even apply; are they specific per type or can you compare across displays for a day. These certainly dont show that pedestrians were 20x more than cyclists on this day. This kind of flashy graphics is used to dazzle people without being critical of the data sourcess. 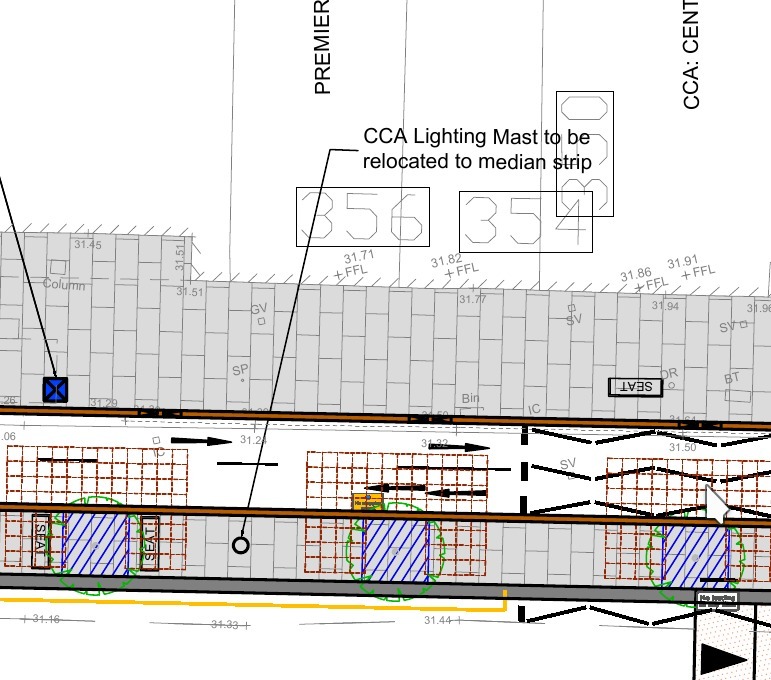 This is NOT the way to do design and make decisions that will inpact the safety of people..
A waste of time effort and money that can be used to justify unsafe designs. 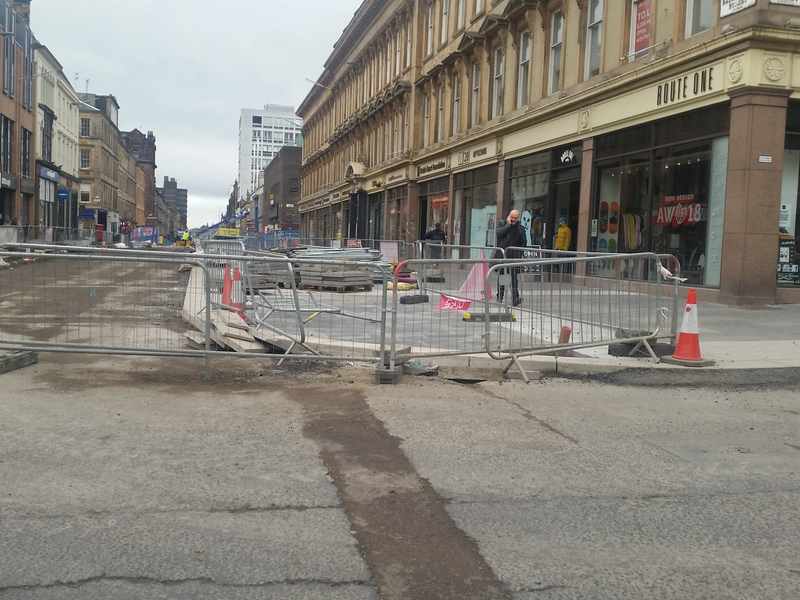 I wrote a post last year about the Sauchiehall Street Changes. 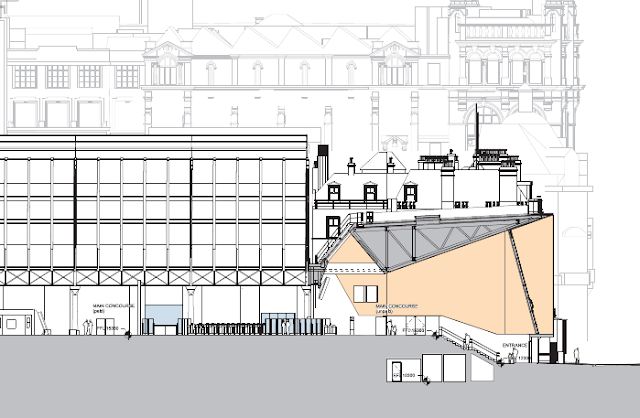 The Glasgow School of Art fire and closure of the street has even more confused what is going to be achieved and whether those changes will be of benefit to the street. The changes to Victoria Road have also started to appear and as usual reduce pedestrian space once the bins. poles. A frames, seats etc are placed on the space left behind, unlike the artists impressions used to sell the idea. 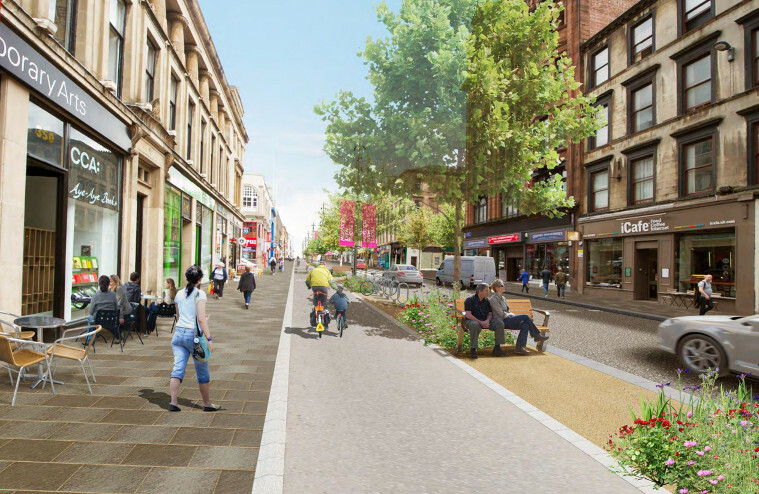 Now there is a consultation for changes in North East Glasgow ( Glasgow North East Active Travel ) . "If the only tool you have is a hammer, everything looks like a nail"
TLDR: This proposal treats an area as a crossfit course for others to use as they pass through with limited benefit for those who live there. Wallacewell Road has had separated cycle lanes on both sides for many years . To say they are underused implies there is a large number of people who would use them but for some unknown reason. It is a shock to see a bike on them . 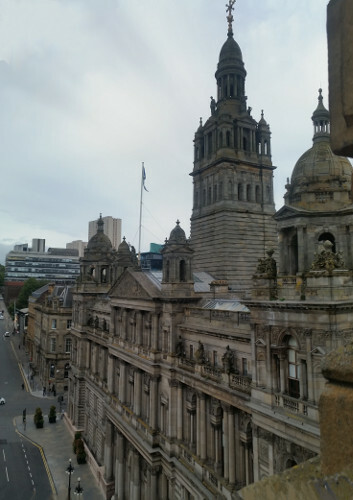 However as some groups have money to spend the intention is to put in more lanes rather than make informed decisions about what would be good for people living here. The decisions to proceed so completely with cycle lanes without the other area users being helped appears set in the belief "Build it and they will come". 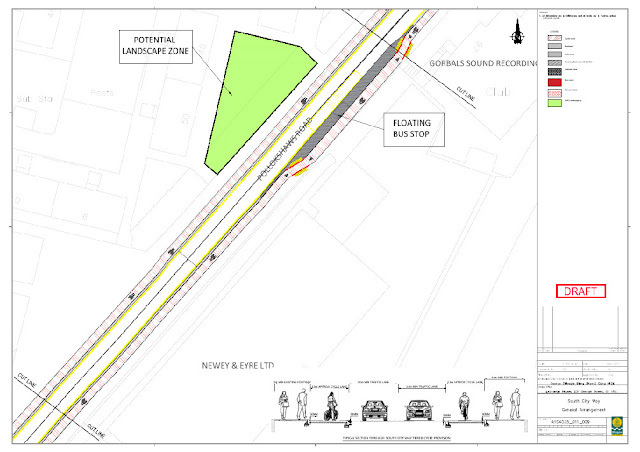 The lack of safe pedestrian crossings on this stretch of road being used to try to sell the expenditure on these cycle lanes, and bus islands, is a failure of previous planning . This is a basic failing under the Equality Act and the required Equality Impact Statements should have forced these changes without being an add on to another scheme. Proper controlled crossings would be needed to make the area safe for impaired,elderly and others but the design presented adds the bare minimum tactile strips with not enough controlled crossingss. It is trying to make the previous ignoring of this part of Glasgow as a positive to be built upon rather than treat it as the contempt for the safety of people living in the area that it is. The safe crossings should be going in regardless but not be used to justify expanded cycle lanes that reduce the safety of pavement and bus users. The safety of the elderly, impaired and people with younger kids has been ignored until it could be tacked onto something else. It should have been the priority. Here is the strava heat map so beloved of planners. 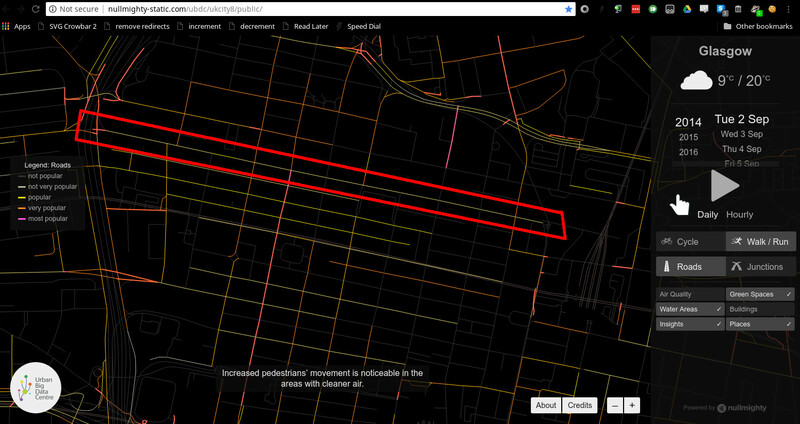 I have indicated the roads in this proposal beside a thick yellow line so that they can be picked out. NB these data displays are pretty useless as the data is only provided by a set of self selected people who want to participate and data for pedestrians, public transport users is never as flashy. This really does emphasise that the providers of this data are not living in these areas but just pass through. 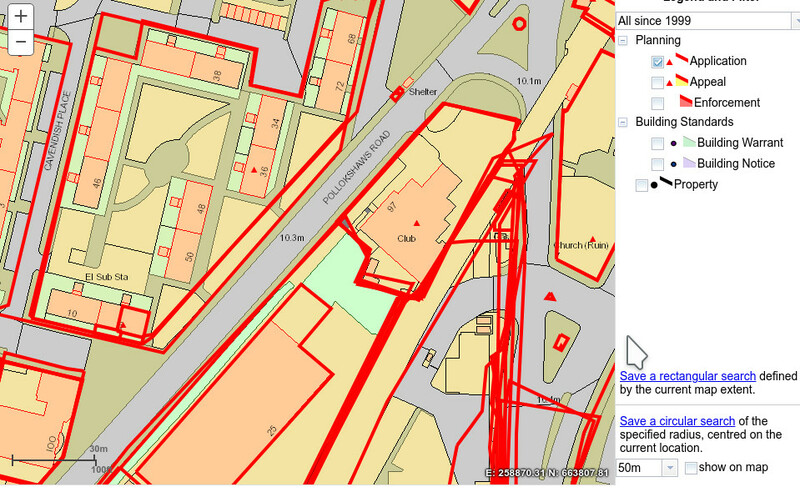 NB the large dark areas with no start points for journeys.It is actually interesting that more people go over Balgrayhill that use the existing cycle lanes on Wallacewell Road. 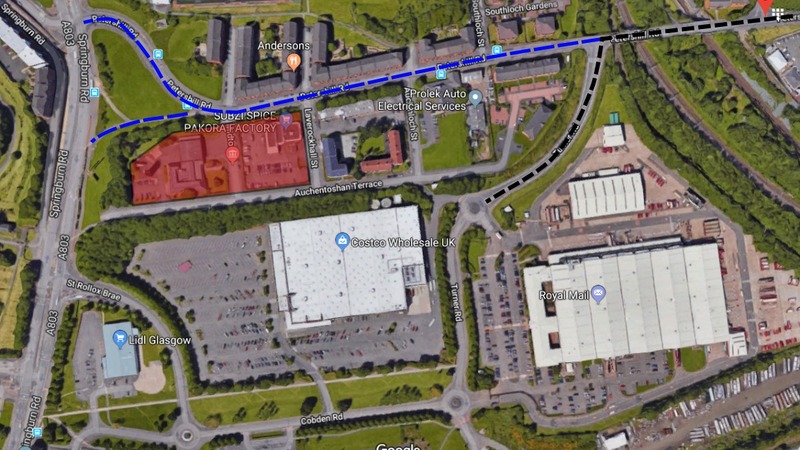 If there was a push to get next bikes in the area you could take this proposal seriously but there isnt and this is just to turn the area into a bike track for people in surrounding areas. 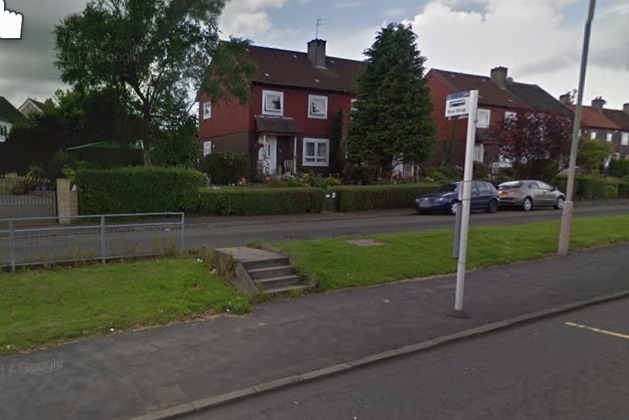 The highest point in Glasgow is just to the left of the top of Broomfield road in Springburn Park. The are many height changes and some challenging slopes, so these changes are not for the casual local out for a ride with the family, they are for commuters out of the area passing through. They treat the area like a training course rather than an area people live in . They do not make it easier for people to access the hospital which would have been a useful thing to do when "active" and "travel" are in use. 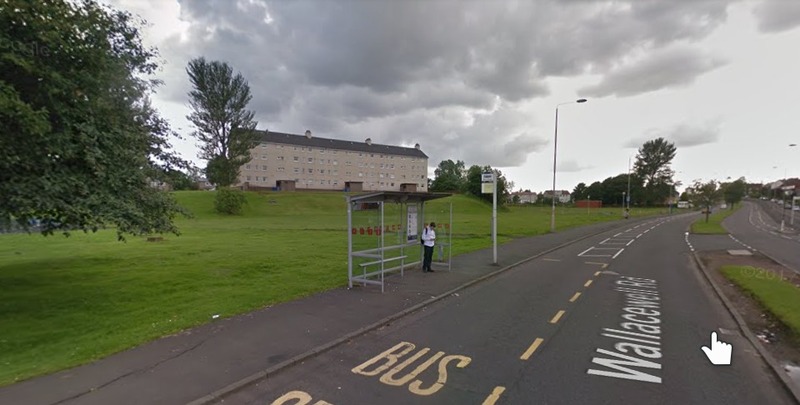 Is this stretch to the top of Broomfield Road just to let people get to do their Strava laps in Springburn Park ? 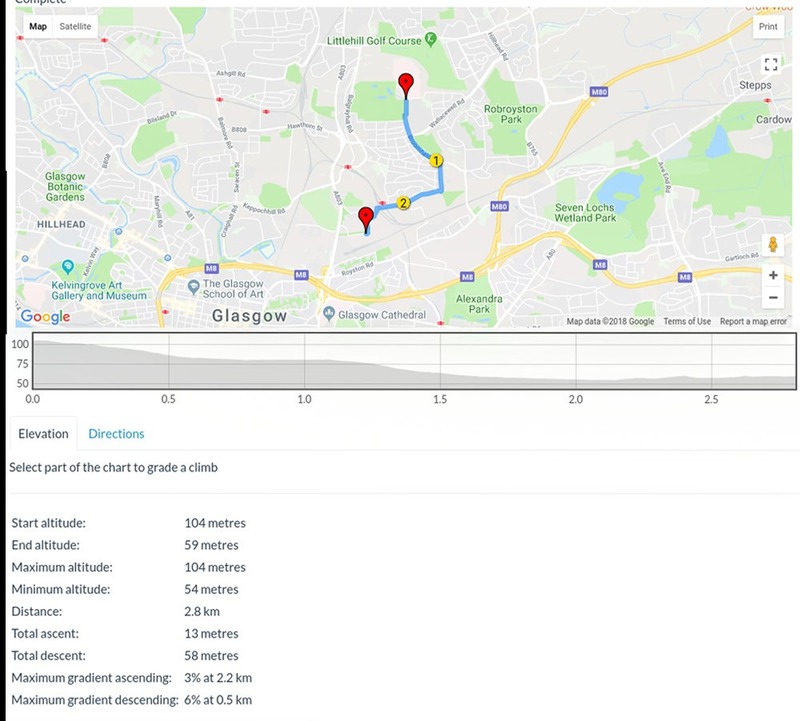 A destination that may make sense for kids to cycle to , Petershill FC , is ignored in the plans ( eg the blue line, the black line is the planned route ). Is this section of street ignored as the cycle lanes are for commuters to pass through rather than for use by the the people living with them in their streets . 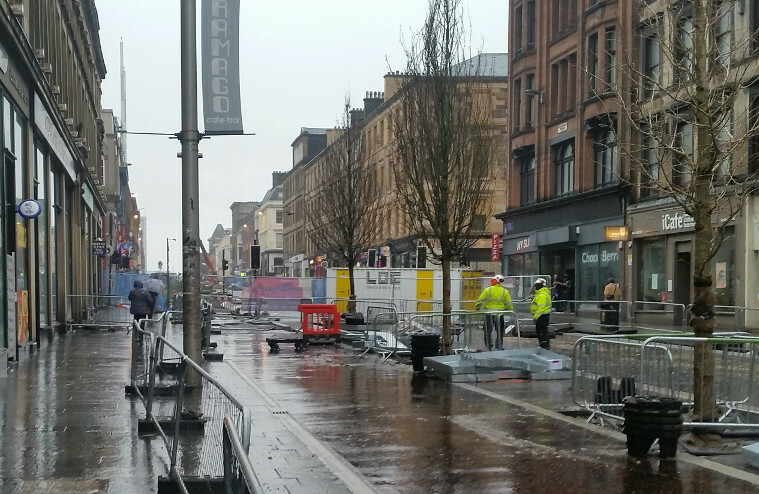 NB On this street ( Red Road , nice steep road for elderly or impaired ) the busiest bus stop is being removed. If this was meant to be of use to local people there would be a comprehensive integration to allow people to choose their travel method. The area needs more local buses, too many people rely on taxis. There should be provision of seated areas to let people who chose, or are forced by circumstances, to walk rest. It should be clear that bus users have adequate shelter in bad weather . There should be better paths for pedestrians to get access to streets instead of cutting across areas. ( Fixing this does not mean just remove the bus stop but address these issues and not just put in cycle lanes ). 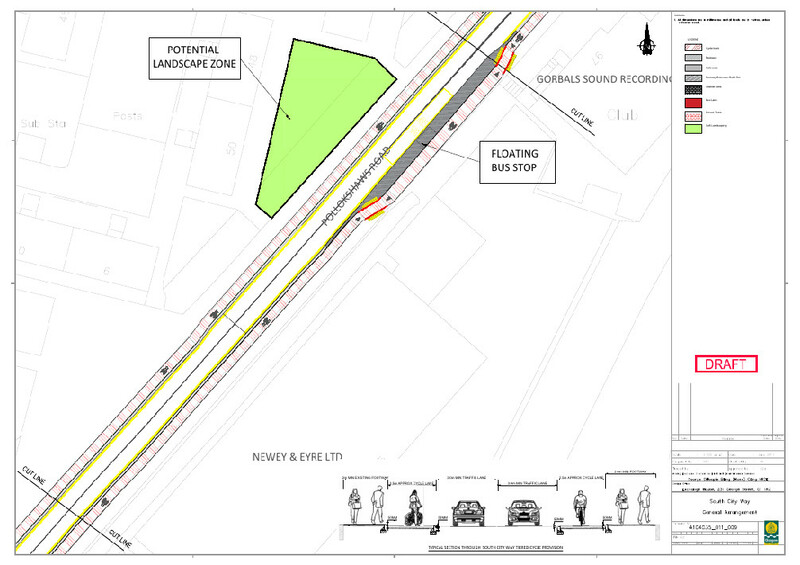 There is no addressing issues like this in the plans so this is in no way to make things better for locals, it is just to justify putting cycle lanes in. How about making things better for people walking here by putting seats along this area; or some additional paved paths crossing the area if there are going to be no other amenities or upgrade. At the bus islands have and enforce a speed limit of 4 mph as , say, powered wheel chairs have when in this close contact with vulnerable unprotected people on the pavement. This design like too many in this city is cycling lead with some additions to make it look like there has been thought for anything else. The needs of public transport users and pedestrians especially the elderly, those with children and impaired users are always an afterthought. When Glasgow has a "Strategy for pedestrians and public transport users" like it has a "Strategy for Cycling" it will start to be properly inclusive and accessible. If they could start by creating accessible doumentation and surveys that would at least be something. So i went along to the consultation. Two council representatives not taking notes. A good number of local residents angry about plans after them having cycle lanes imposed on them before. This just adds to confusion when they clearly didnt add more cyclists. 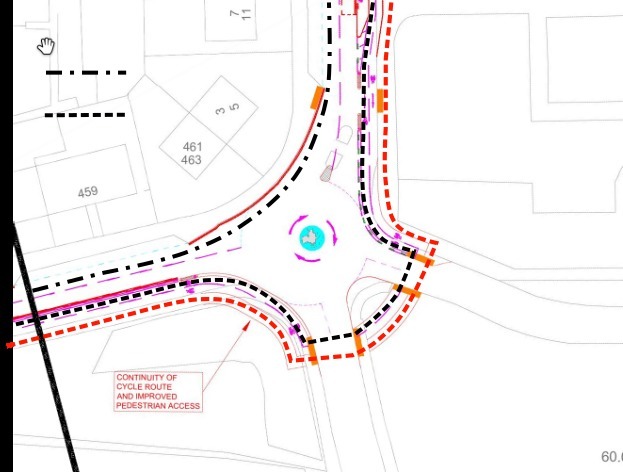 Crossing at roundabouts not straight but should be, just a choice of the plan preparer. Bus number counts not been done so removing busy stop at top of Read Road just arbitrary choice. The choice was made because when the cycle lane goes in there is limited room for the bus shelter, nothing to do with need just to make cycle lanes possible. If the counts are done do they take into account access issues to the stops. The stop to be removed has at least one person using a walking frame using it; do they only count as one body or are their , and others, additional needs taken into account ? probably not if Sustrans are involved they seem to have issues with disabled and impaired people having to be accommodated in their push for cycle lanes above all else. Equality Impact Assessment and statement not created yet so that will be the usual one paragraph "No impact to anyone" boilerplate. Leaflets for meeting attendance only went to houses directly on street not on the surrounding streets that feed into them directly. Council really needs people who live in these areas and use public transport and walking rather than cyclists and car drivers to be involved in these decisions. Feeling was this is just being forced on area , council will get blame while Sustrans just avoid it as usual. Sustrans get too much money and control over design on infrastructure. 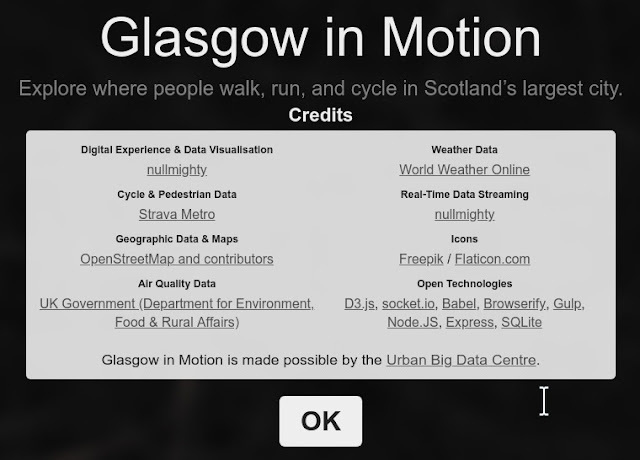 Split the money to the communities rather than just do what Sustrans want. 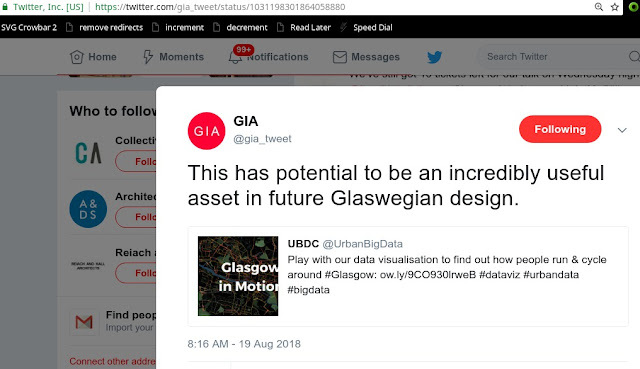 As an article in August 12th Scotsman calls them "Cycle path developers Sustrans" i think that is appropriate and they should not be allowed to impose this narrow view while hiding behind "Active Travel" and disregarding those living in an area and public transport users. Just remembered to check there are no proper crossing points added on Northgate Road. Pavement users still have to walk across grass or through car turning gaps. Why do Sustrans and the Council always put pavement users at the bottom of any design. Cleared and at end of dry spell, so as weed free as its going to ever be. As part of the station redevelopment the buildings in front of the old arch are being removed. The arch will , as has always been the case , be viewable from the interior once the new building is complete but with increased light . The additinal track length for longer train sets requires an additional building to accommodate passengers and the ticket centre to be built in front. There seem to be a lot of people wanting to be able to see the full arch but have no consideration for the people using the station. It is a working station and was always built as such. People who dont use the station may not have realised the arch , at both ends, was viewable from the inside or by going to Cathedral St.